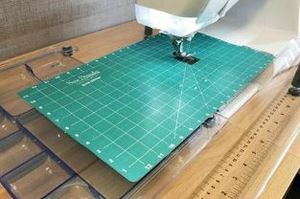 NEW GRID GLIDER is a extremely slick polyester mat that has a 12"x20"printed grid including seam allowances, and degrees to meet all your sewing and quilting needs. Create a slick sewing surface for free motion quilting! Polyester mat with micro suction technology secures to Table and sewing machine. Has a 12” x 20” grid printed on it, as well as a rectangular hole cut for feed-dogs.